In the backdrop of the sixth Sukhoi crash in six years, here’s a look at some factors that contribute to the IAF’s high crash rate. More than 200 Sukhoi Flankers currently form the core of the Indian Air Force’s strike element, for a planned force of over 272 Su-30 fighter-bombers. India received the initial batch of Sukhois in 2002. The first of these aircraft crashed in 2009, and since then five more have crashed. The People’s Liberation Army Air Force (PLAAF) has 150 Flankers of Russian origin and 229 Chinese knockoffs. That’s a total of 379 aircraft, for an eventual figure of 400 Russian made Flankers, derivatives and illegal copies. And yet the PLAAF has lost fewer Sukhoi in crashes. Are the Chinese Sukhois better maintained, better built or are Chinese pilots simply playing it safe? More on that in a moment. The IAF calls the Su-30 its “air dominance” fighter for a good reason. The arrival of the Sukhoi has decisively tilted the balance of power in favour of the IAF in the region. The Flanker’s super-maneuverability, its armoury of advanced beyond visual range missiles and extraordinary range of 3000 km (extendable to 8000 km with aerial refuelling) are aspects that make it the wolf of the skies. The Su-30 is also equipped with synthetic aperture radar (SAR), which gives it greater long-range reconnaissance capabilities. Armed with the SAR pod, the IAF Sukhois are known to engage in aggressive patrols along the China-India and India-Pakistan borders. Considering the Flanker’s hunter killer reputation, anyone who questions its capability is clearly living under a rock. So what explains the loss of six IAF Flankers in crashes? Let’s go into the various probable causes and also dissect the theories floating out there. The first ever Su-30MKI crashes in the Pokhran region, Rajasthan. The IAF’s Court of Inquiry establishes Wing Commander Vishwas Munje mistakenly switched off the warplane’s fly-by-wire system. Sukhoi crashes near Jaisalmer, Rajasthan, after a fire warning. An IAF investigation attributes it to accidental ingestion of a foreign object in the engine intake. Aircraft crashes 20 km from Pune. IAF says the crash is due to a malfunction in the fly-by-wire system. Aircraft’s right wing explodes over Pokhran, shortly after completing a training mission. Fly-by-wire system malfunctions yet again and the Sukhoi goes down near Pune. Russian experts blame pilot error but the IAF says the Court of Inquiry is yet to pinpoint exact reason. Su-30MKI flying from Tezpur in Assam develops a technical snag and the pilot is forced to abandon the aircraft. Cause is yet to be established. Now that you have a good idea of what exactly happened in those six crashes, let’s look at the possible reasons why jet fighters crash in India. The IAF is one of the few air forces in the world that conduct intense, year-round training. Benjamin Lambeth of the Carnegie Endowment for International Peace says the IAF trains for a "high intensity, high stakes" conflict. Keeping in mind the possibility of a two-front war, the IAF puts its pilots and aircraft through the wringer. Mock air combat can involve hundreds of aircraft flying thousands of kilometres. During such a war game in 2013, Sukhois flew 1800-km bombing missions from Chabua in Assam to the western front, with mid-air refuelling. In fact, IAF pilots are known to lead missions over 10 hours in their Sukhois. Such training places a great deal of stress on aircraft, pilots and air crews, which means potentially more accidents. But that’s the way the IAF trains for war. In fact, a former air force chief has gone on record that he would rather lose pilots during training than during war. The strategy has been amply rewarded. In the 1971 War, for instance, the IAF was able to conduct a wide range of missions – troop support; air combat; deep penetration strikes; para-dropping behind enemy lines; feints to draw enemy fighters away from the actual target; bombing; and reconnaissance. In contrast, the Pakistan Air Force, which was solely focused on air combat, was blown out of the subcontinent’s skies within the first week of the war. Those PAF aircraft that survived took refuge at Iranian air bases or in concrete bunkers, refusing to offer a fight. A PLAAF fighter pilot would most likely be reprimanded if he deviated from the flight plan set by his commanders. Losing a plane would be cause enough for a court martial. Thankfully, the IAF does not believe in having robots but values superior training and innovativeness. IAF pilots have truly internalised what Sergei Dolgushin, a Russian Air Force ace with 24 victories in WWII, said is a prerequisite to be a successful fighter pilot: “A love of hunting, a great desire to be the top dog”. Harsh is normal in India. Tropical India is an unforgiving environment for any aircraft. The hot air means aircraft engines produce less thrust and the wing produce less lift compared to similar aircraft flying in European skies. Sun baked runways are also known to impact landing safety. These are factors IAF pilots have to live with. Bird hits are another huge factor in aircraft accidents over India. The IAF attributes around 10 per cent of accidents to bird hits. Most IAF bases are located near populated areas, where birds are a constant menace. The situation has got so dire that the IAF last year issued global bids to four companies for 45 bird detection and monitoring radar systems to be installed at airports and air bases across India. According to figures released by the Ministry of Defence in March 2013, the IAF was losing the equivalent of one fighter squadron (approximately 18 fighters) in accidents every two years. This was primarily because of the lack of adequate number of trainers. Rookie fighter pilots begin on basic trainers, then move on to intermediate jet trainers (IJTs) before finally graduating to advanced jet trainers (AJTs). These three stages are critical elements of fighter pilot training and any shortcuts will certainly lead to disaster. But what was happening was that in the absence of an AJT, rookie pilots were moving straight from the IJT to frontline warplanes such as the MiG-21. The upshot – young pilots died at an alarming rate. With the induction of the Swiss Pilatus basic trainer and Hawk AJT from Britain, the crashes have come down – but not stopped. India is notorious for its ‘chalta hai’ or ‘it’ll be alright’ attitude. In this backdrop, shoddy maintenance could well be a factor. Although the IAF is known for its high standards, those standards are largely of its pilots; maintenance crews may not share that quality. Of late, there have been a number of incidents reported widely in the media about IAF ground crew involved in all sorts of serious crimes. The IAF should look at establishing an elite division of ground crews to service its high-end aircraft. The IAF’s fleet strength is currently down to 34 squadrons or around 600 warplanes. The sanctioned number is 42 squadrons. In a country as vast as India, with multiple threats, such depletion in fighter aircraft means fewer aircraft have to perform more missions to get the same job done. It also means less down time in maintenance hangars. This is where India quickly needs to induct more locally built Tejas interceptors and more locally assembled Su-30s. The good news is that aircraft crashes in the IAF have shown a declining trend over the last three years. From a high of 30 in fiscal 2011-12, they declined to six in 2012-13 and an equal number in 2013-14. The IAF is now looking to improve overall fleet serviceability. The air force recently told a parliamentary committee that fleet-wide serviceability stood at 60-65 per cent, but could be increased to 77-80 per cent, provided spares were made available. While the IAF is clearly doing its best under the circumstances, it needs to do better. Bringing the crash rate down to US or European air force levels should be the goal. 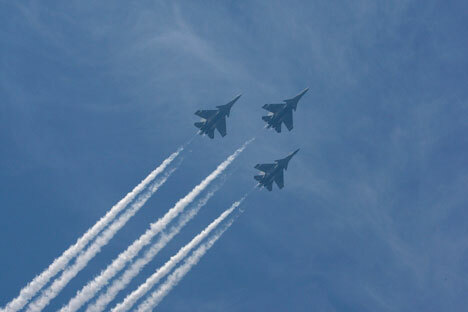 Losing a Sukhoi each year is akin to burning Rs 350 crore in cash.